South Your Mouth is very popular, getting over 1 million visitors a month. Mandy’s first book was a success and her second book South Your Mouth Some More was recently released. It is sure to be a success too! I first saw Mandy years ago as a guest on Paula Deen’s show and her blog is one of my favorites! I was lucky enough to receive a copy from the publisher to review. I received the book the day before I was leaving for a trip to Las Vegas. You can guess what I read on the flight to and from. I love Mandy’s recipes. She creates what I call “real food” dishes that anyone can make at home. Perfect for busy cooks, using simple ingredients. If you’ve ever visited her blog and read a few of the post, you’ll find humorous stories and delicious food. That shines through in her books too. South Your Mouth Some More is 208 pages filled with recipes and stories. It’s filled with a lot of NEW recipes that you will not find on her blog along with some of the favorites that are. I chose two recipes from the book to make to include in my review. I can tell you they were both delicious. There was one recipe in the book that inspired me to create a new recipe. I’ve got a lot more bookmarked to try soon. So whether you enjoy collecting cookbooks, need help in the kitchen with recipes, or are learning to cook – you’ll love South Your Mouth Some More. 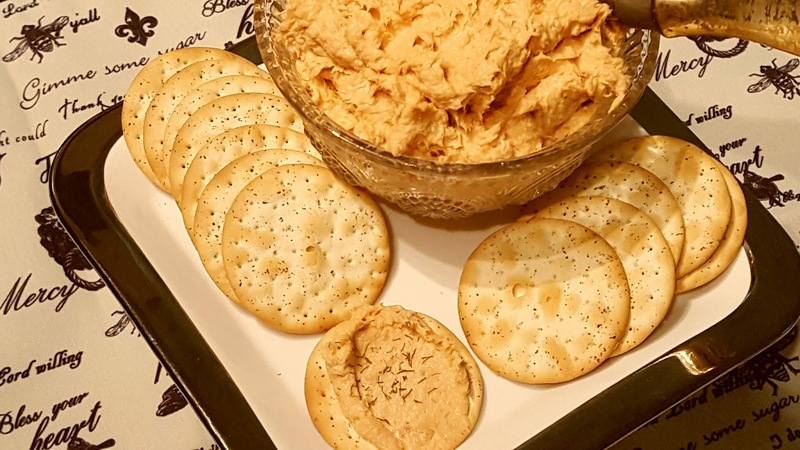 Red Salmon Spread is a great appetizer and I’m glad to have the recipe in my collection now. 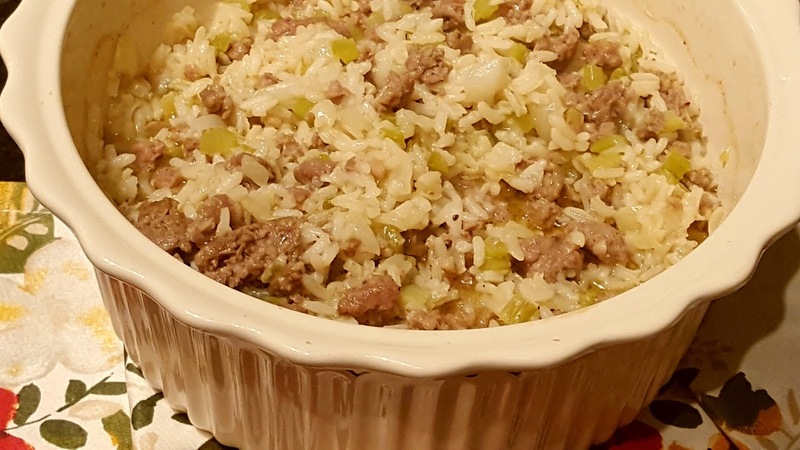 The Sausage and Rice Casserole was easy to make and is great for a meal itself or a side dish! UPDATE: Congratulations Freda Burkett! You’re our winner!! Enter the giveaway for a FREE copy of ‘South Your Mouth Some More’. The lucky winner will be announced Friday (October 28, 2016) .Tell your friends and family so they can enter too! The winner will receive an email. Love Mandy's southern charm!! What a great giveaway!! I collect cookbooks and read them like novels. I have always collected cookbooks ever since I first married a long time ago. I enjoy looking at others ideas on food. Nothing is better than sitting down and reading a cookbook from cover to cover, especially southern cooking. Marking pages and than cooking the recipe for the family table. This is a pastime I shared with my mama. Can't wait to try some of her beloved recipes. I love cookbooks because reading them makes me feel like I am sitting in the kitchen with all the cooks. Mandy has come through with another great cookbook! Love all of Mandy's recipes, and have made several of them. Would love to have her cookbook. Love all of Mandy's recipes and cant wait to get her new cookbook! I've followed her for years now also. Thank you so much for offering her cookbook to your readers! Good Luck all y'all! I collect cookbooks and love to read them…plus cook from them! Collecting & reading both old & new cookbooks is one of my favorite things. As I read through them I pick recipes that sound like something I want to make. When I'm ready to try a new recipe, I always have some recipes to pick from. With Pinterest and the blogs all over the Internet some people have a hard time understanding why a person would still want a printed cookbook. I love being able to pick it up and read it like a book. If I try recipes I like to make notations and flag the pages for future use. You just can't beat a cookbook. I love collecting and reading cookbooks. CONGRATULATIONS! You are the winner. I hope you enjoy your new cookbook. It would be great to have this to go with my cookbook collection! I totally need this for my beloved cookbook collection!! South Your Mouth is one of my very favorite blogs!!!! Love her!!!!! !